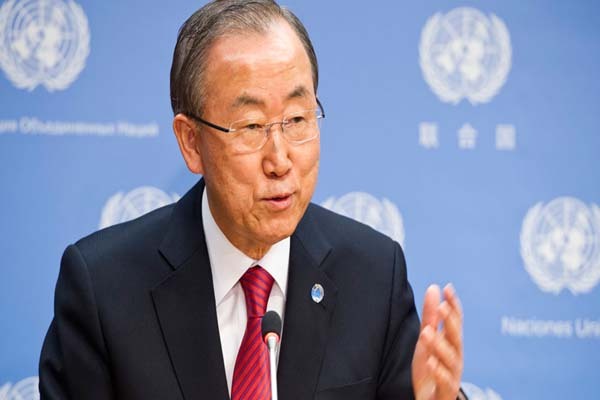 UNITED NATIONS, July 12 (APP): UN Secretary-General Ban ki-moon has called on all parties in Indian-held Kashmir to exercise “maximum restraint” and address the tense situation there through peaceful means. “The Secretary-General is closely following the recent clashes in Kashmir,” he said on Monday in a statement issued through his spokesman on the situation in the Indian-held Kashmir where at least 30 protesters have been killed by Indian security forces following the shooting of a well-known Kashmiri leader. The leader, Burhan Wani, 22, died in a gunfight with the Indian army on Friday, according to media reports. “He (the UN chief) regrets the reported loss of dozens of lives and the injuries to many others,” the statement said. “He calls on all parties to exercise maximum restraint to avoid further violence and hopes that all concerns would be addressed through peaceful means,” it added. The statement was issued late Monday evening was after the secretary-general’s spokesman, Stephane Dujarric, in response to questions, told reporters that Ban was “concerned’ over the heightening tensions in Indian-held Kashmir. The violence is the worst seen in the disputed region for years. Some 800 extra troops are being sent to help restore order. More than 200 other people have been injured in the clashes, in which government forces have fired live rounds and tear gas, the reports said.